College Park bars anticipate crush of fans, bring in extra security, radio station DJ. University looks for big fund-raising bucks from Final Four. Police prepare for Final Four. 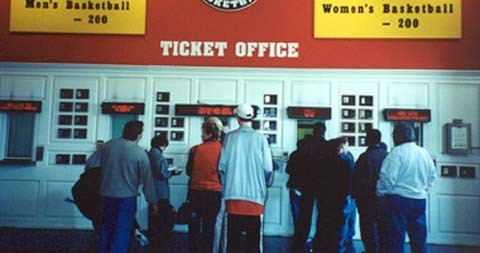 Terp fans line up in front of the Ticket Office at Cole Field House to buy their Final Four tickets. Thursday, March 29, 2001; Web posted at 7:15 p.m.
COLLEGE PARK, Md.—University of Maryland juniors Catherine Murphy, Elizabeth Alberts and Kathleen Collins are on their way to the Final Four in Minneapolis, Minn., but have no idea how they’re getting there. No matter how the women travel to Minneapolis, making the Final Four trip is expensive—and expensive is keeping College Park vendors happy. Theobald said that the Book Center is receiving two to three shipments a day of Final Four T-shirts, hats, visors and youth shirts. By the close of business Wednesday, the Book Center had sold 7,000 T-shirts alone. Theobald’s favorite? The shirt with the Final Four schools’ logos. The public’s favorite? The white visor forward Terrence Morris wore at a press conference after last Saturday’s win over Stanford. University Book Center General Manager Stan Lohman said that style sold out, and he is unable to order more. Lohman said that after last Saturday’s win, the Book Center had Final Four T-shirts printed that were on sale by early Sunday afternoon. Should the Terps make it all the way Monday night, Lohman plans to have national championship shirts available by Tuesday morning. The university will gain money from sales of all merchandise with any of the school's logos. Maryland, like all other schools in the Atlantic Coast Conference, shares an 8 percent royalty on the wholesale price of such merchandise with Atlanta-based Collegiate Licensing Co., which handles contracts and other dealings with manufacturers. The school's share is split evenly between the athletic department and the university. Brian Darmody, the university's assistant vice president for research and economic development, said Maryland merchandise earned roughly $300,000 in royalties in 2000, about $100,000 of which went to athletics. Darmody, who is also Maryland's trademark licensing director, said the Terps' Final Four appearance means there is "no question this will be a record-breaking year for royalties, even if we lose to Duke." Many Terp supporters can't wait to wear their recent red and black purchases. Norwood S. Swann, a university employee in Facilities Management, was just one of hundreds of walk-up patrons at the University Book Center Tuesday. “I hope to be wearing these on Saturday,” Swann said of the two caps and shirt he bought. Greg Schiller, associate ticket manager for University of Maryland Athletics, says this event is among the busiest he’s experienced. The University of Maryland was allotted 4,500 tickets for the Final Four event. Tickets went on sale March 26 and were sold out by the next afternoon to students ($160 each) and Terrapin Club Members ($140 or $160 each). Alumni never had the chance to purchase tickets. “I got here at 7 Monday morning, and there were close to 200 students already in line,” Schiller said. Maryland's athletic department will get a portion of the tournament revenues, which are evenly divided by member schools of the ACC. Conference schools shared $7.4 million in 2000, said Nikki Watson, assistant to the NCAA's director of finances. As it turns out, Murphy, Alberts and Collins bought some of the last available tickets to the tournament on Tuesday afternoon. But will they drive? Will they fly? It remains to be seen. The trip by car is estimated to take about 19 hours from College Park, but is less expensive than flying. General Web searches for roundtrip airfares from the D.C. area to Minneapolis showed them ranging from almost $300 to well over $1,000, depending on departure times and locations. Then there are room accommodations and meals. The list goes on. But it’s worth every penny to some. “I never thought I’d have the chance to go to the Final Four to watch my school play,” Collins said. Capital News Service staffer Richard M. Todaro contributed to this report.